Stay on top of technology so your users can too! Upgrade today to 10.3.1b. Posted in 10.3.1b	on Aug 17th, 2015 | Comments Off on Stay on top of technology so your users can too! Upgrade today to 10.3.1b. If they haven’t already, your users will be asking for Windows 10 support soon. Be prepared! Windows 10 has many new features that your users may want, including an improved Start menu, enhanced security, and a new browser—and the upgrade is free to consumers. More importantly, many new PCs will come with Windows 10 preloaded. Fortunately, Synergy/DE’s new 10.3.1b release includes Windows 10 support, so you can offer your users the latest technology and meet their requirements before they even ask. Download Synergy/DE 10.3.1b today. Posted in DevPartner Conference	on Mar 24th, 2015 | Comments Off on Meet Vi Sprezz! Jodah says, “I haven’t seen decisive management like this since Manny made us pull the car into Krispy Kreme when he saw the “Hot Now” light go on. Early bird discount for the DevPartner Conference ends March 31. Register today! Going mobile just makes sensei. Synergy/DE 10.3 will make it possible. 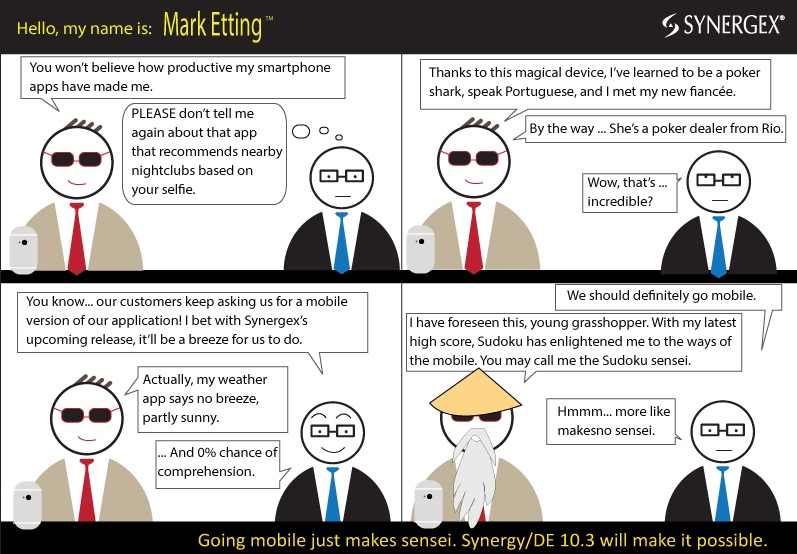 Posted in Synergy/DE 10.3	on Mar 4th, 2015 | Comments Off on Going mobile just makes sensei. Synergy/DE 10.3 will make it possible. Start developing your mobile Synergy apps today with Synergy/DE 10.3 Beta 2—just released! And check out everything else 10.3 has to offer. We’re excited to announce Synergy/DE 10.3 Beta 2. This new release provides additional 10.3 features to help you develop Synergy apps for mobile devices, as well as many features for Synergy .NET and traditional Synergy development. Version 10.3 delivers our initial Synergy .NET support for Mono, an open source, cross-platform implementation of Microsoft’s .NET Framework that provides a portable path to multiple device platforms. With Mono support, you can use Visual Studio and Xamarin tools to create Synergy applications initially for Android and iOS devices, and in the future for OS X and other platforms. The code you develop now for Android or iOS will transfer to other platforms later. 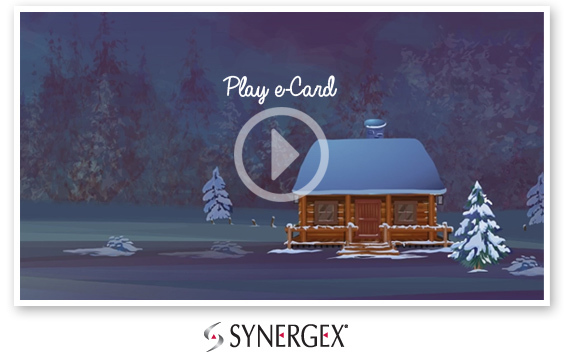 Posted in Synergex	on Dec 20th, 2014 | Comments Off on Season’s Greetings from Synergex!